The barren, hilly, rather featureless land that surrounds Mono Lake in most directions is interrupted in the south by a chain of volcanic cones, part of the Mono-Inyo Craters - a 25 mile line of volcanism extending to Mammoth Mountain beside Mammoth Lakes, and also including the Devils Postpile. The craters are associated with, though are not directly part of, the Long Valley Caldera a little way further south, one result of which can be seen at the interesting Hot Creek geological area. More than two dozen craters and several glassy lava flows (coulees) are found within a few miles of Mono Lake, many perfectly symmetric in form and exhibiting a variety of colors and rock types. 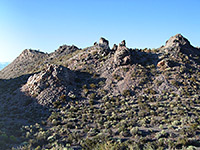 All are relatively easy to explore by walking at most three miles from the two nearby main roads (US 395 and NV 120), or driving closer via some dirt tracks, but the northernmost (Panum Crater) can be reached by a maintained track, leading to a BLM trailhead with parking area and information boards. Beside the interesting geology, the crater is high enough for excellent views over Mono Lake and the steep east face of the Sierra Nevada. 8 views of Panum Crater. The signposted gravel track to Panum Crater forks off NV 120, 1.5 miles west of the turning for the South Tufa area. It crosses sagebrush flats for a mile to the parking area at the foot of the cone - a possible place for free camping, given the absence of any No Camping notices, unlike the much busier parking lot at the nearby tufa formations. A short path climbs up the ashen slopes to the crater rim then splits; one branch heads northwards to a viewpoint of Mono Lake and continues all around the rim, while the other descends into the crater then climbs again, to the top of the rocky dome occupying the center of the volcano. This doesn't look too interesting from afar, as its slopes are mostly smooth and partly covered by bushes but once at the end of the trail the dome is revealed to consist of a jumbled, irregular mass of volcanic boulders completely without any vegetation, covering 25 acres, and rising to steep, narrow pinnacles 20 feet high in several places. 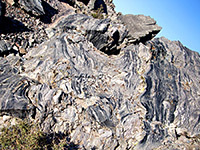 The most prominent rock is glassy black obsidian, which forms strange banded patterns - mixed with gray rhyolite and lighter-colored pumice - and occurs in solid layers several feet thick in some locations. Sharp broken pieces of obsidian are strewn all around and the larger boulders are also jagged and unstable, though the area (beyond the official trail, which ends at the edge) can still be explored with care. 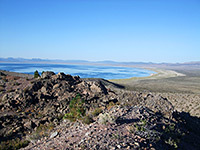 The higher points have panoramic views over Mono Lake, the shore of which is one mile distant and 700 feet lower, as well as several other, higher craters further south. The central part of Panum Crater is a rhyolite dome, formed around 650 years ago by slow rising of viscous, relatively cool magma rich in silica, hence the high obsidian content of the resulting rocks. Surrounding the dome is a tufa ring, slightly lower in height, composed of ash and pumice ejected from the vent in an earlier, more violent stage of the eruption. The narrow spires seen today on top of the dome were created when the main mass had cooled and hardened, but the residual lava below still had enough force to split the surface and extrude into pinnacles.